Sailing under the brand name of Cruceros Maritimos Vacacionales, Cruise & Maritime Voyages (CMV) and officials from Acapulco and the Mexican state of Guerrero have confirmed plans to launch service with the 1,400-passenger Magellan sailing from Acapulco during the winter season 2019. With the first sailing scheduled for Feb. 3, 2019, the Magellan will offer a seven-day program, departing on Sundays, and calling at Cabo San Lucas, Mazatlan, Puerto Vallarta and Manzanillo, according to John Dennis, vice president of CMV. With Mexico City within a four-hour drive from Acapulco, Dennis said that CMV will be opening a sales office there over the next few weeks. The average price for a seven-day cruise will be $699 or about 14,000 peso, according to Dennis. For 2019, the Magellan will sail 10 seven-day cruises, but plans call for extending the 2020 season to five months and eventually possibly going to year-round operation, according to Nicholas Tragakes, CEO of Global Maritime Group, the parent company of CMV. 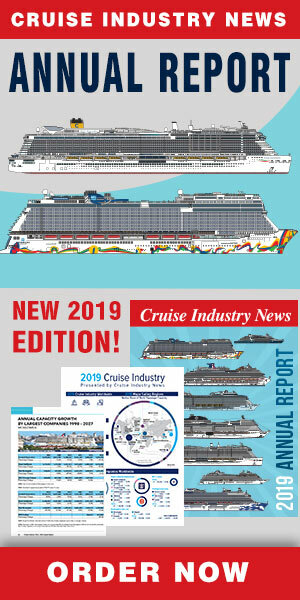 Tragakes noted that Mexico fits into the company’s strategy of creating national cruise products, pointing to its national products in the UK, Germany, France and Australia. With a longer season, Tragakes also said that interporting would be possible, embarking not only Mexican passengers in several ports, but also international passengers, considering the air connections these destinations have. However, 80 to 85 percent of the passengers are expected to be Mexican. Dennis added that Mexico already generates from 110,000 to 120,000 cruise passengers annually who travel to Southern Florida and elsewhere to cruise, and that CMV would tap into this market in addition to the many who do not have visas, but still fit the cruise passenger demographics. He noted that 70 percent of Mexican tourism is within Mexico. Sunday departures will also enable passengers to spend Friday night and/or Saturday and Saturday night in Acapulco and that pre- and post-packages were being prepared, combining a land stay up to seven days with a seven-day cruise. Another market the company is considering is incentive cruises. Eventually, Tragakes said that Mexico may also become a source market for CMV’s ship in the UK and elsewhere. Meanwhile, Acapulco is ready to handle turnarounds, according to Bernardo Varela, director of Grupo TMM, the terminal operator. He said that the port already handles turnarounds for CMV as well as other brands. Jesus Radilla, undersecretary of the ministry of tourism for Guerrero, pointed to the significant private and public investments being made in the infrastructure, tourism offerings and attractions in Acapulco, bringing the town back to its former days when it was hosting the rich and famous from around the world. Photo: Seated (from left): Nicholas Tragakes, CEO, Global Maritime Group; and John Dennis, vice president, CMV. Standing (from left): Alexos Tsokos, director of finance, CMV; Abraham Garay, general director, Acapulco DMO; Bernardo Varela, director, Grupo TMM; Jesus Radilla, undersecretary, ministry of tourism, Guerrero; and Daniel Martinez de Pinilos, country manager, CMV.